For millions of Americans, camping is a go-to activity to escape the hustle and bustle of the modern life. Many people are so eager to immerse themselves with Mother Nature but are not quite ready to do away with modern comforts. So, let's take a look at the Kodiak Canvas Truck Tent and see if will elevate your camping experience. True enough, nothing can put a damper on a camping trip faster than sleeping on a hard, uneven surface during a chilly night. Fortunately, there are ways to circumvent this and that includes having a truck tent. Many truck tent campers prefer the comfort and space provided by their vehicles. However, to make most out of your pickup truck tent camping experience, you need a good truck tent. Don’t worry because we are here to help you out. Let's see if the Kodiak has what you need for a good night's rest under the stars. The Kodiak Canvas comes in two different sizes: the regular that fits 5.5- to 6.8-foot beds and the long size for 8- to 8.5-foot beds. 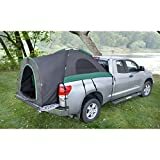 Is this a good truck tent for your camping needs? Let’s find out. Some other pickup truck tent would use oil or paraffin. But, it’s not nearly as durable, and it makes it prone to moisture build-up and humidity. The proprietary Hydra-Shield gives the fabric the ability to wick away moisture in case it finds its way inside. It also minimizes humidity and condensation. Even with strong winds, I have no doubt that this truck tent camper could handle such conditions just fine. The frame poles are made of sturdy steel but are quite flexible. They’re similar to regular tent poles. And they’re a cinch to put together and make for some extra sturdy framework. When it comes to tents for trucks, ease of setup is a major consideration for me. I can imagine that it’s the same way for other people. Fortunately, the Kodiak Canvas Truck Tent is a breeze to set up with the included instructions. If you have the 8-foot version, there are extension rails that need to be screwed in place. This one took me a long time to install. Luckily, this just a one-time task, unless you need to remove the rails at some point. The Kodiak truck tent is set up in a way that the tailgate is down, which helps in adding more space inside. This also allows the occupants to get in and out of the tent easily. The first time we set it up, it took about an hour, including the installation of the extension rails. Once we got to the campsite, it took a mere 15 minutes to pitch the tent. Taking it down is even faster, and the whole thing is easily folded and stuffed into its carrying case. Overall, setting up is easy but make sure you practice first before heading out. So, how does this truck tent feel from the inside? Well, it may not look like it, but it’s really quite comfortable. The canvas material is breathable, so it keeps the interior well-ventilated but still warm during chilly nights. There are also five windows, including a cab access window, which further improves the ventilation of the tent. 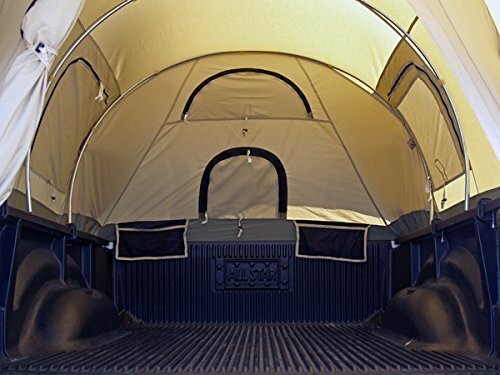 According to numerous reviews by other users online, the Kodiak Canvas Truck Bed Tent is a top-rated product. As of this writing, the tent has 4.5 out of 5 stars with 220+ reviews on Amazon. 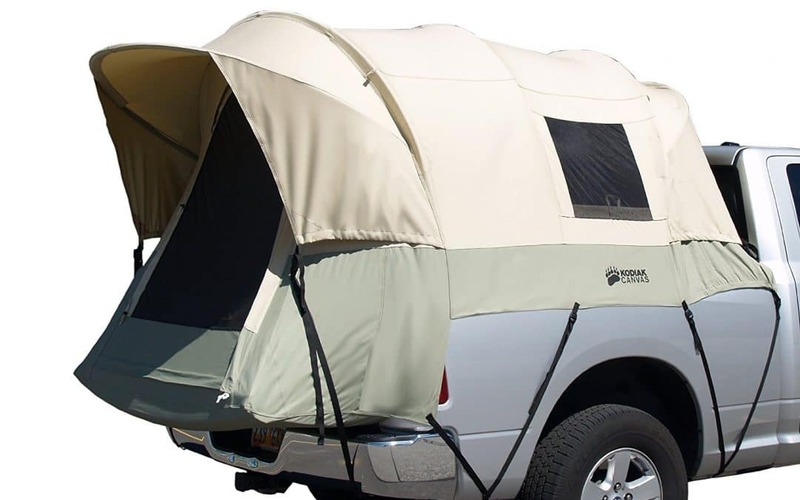 Several outdoor blogs consistently list this pickup truck tent camper among their top three. Many reviewers love the fact that the tent is easy to set up, apart from the initial installation. Many reviewers also enjoy the comfort provided by the tent, thanks to the superior materials and ventilation design. Plenty of users also commented on the excellent durability of the product, even during harsher conditions and after numerous trips. There are also minor complaints about the Kodiak Canvas Truck Tent. Although I said that the tent is easy to set up with the included instructions, other buyers didn’t find it that simple. True enough, there’s a bit of a learning curve when setting up the tent, especially for first-timers. I can imagine that it be a challenge to set up this tent with only one person. Is the Kodiak Canva Truck Tent a Good Buy? Listed at a price range between $350 and $400, as far as pickup tent campers go, the Kodiak Canvas Truck Tent is not the most affordable. 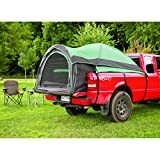 There are other similar truck tents that you can get for about $100 less. However, there’s significant quality here, which we think warrants the price. Just make sure that you practice setting up the tent before you head out camping.